Comtrol's RocketLinx ES7105 is an IEEE802.3af compliant PoE switch designed for a wide range of industrial PoE applications such as IP surveillance cameras, wireless access point, VoIP phone set, POS system, industrial sensors, controllers and security card readers, where a power source is not conveniently located. 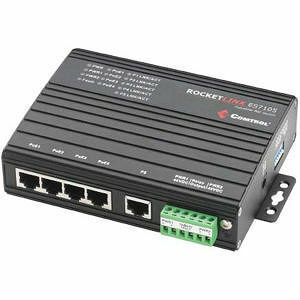 The RocketLinx ES7105 is equipped with 4 PoE injector switch ports, with each port delivering power up to 15.4 watts, and one 10/100Base TX Up-link port transferring data to the central network. The RocketLinx ES7105 is compliant with the IEEE 802.3af Power over Ethernet (PoE) standard for delivering power and data to remote network devices.